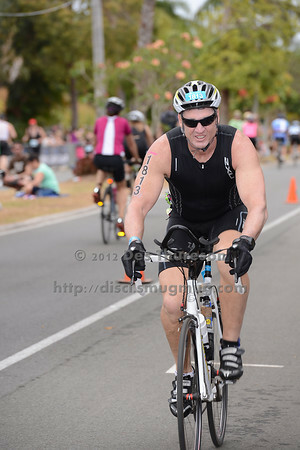 To avoid confusion, here is a brief blog post to assist anyone wanting to purchase a download of images which are in the 'UN-Edited' galleries (like this gallery that you're looking at now): http://disci7.blogspot.com.au/2012/11/buying-noosa-tri-un-edited-pics-2012.html. If you are interested in purchasing any photo, please use the desktop version of this gallery, rather than browsing on your smart phone, so that all the details / procedures are plain to see. The watermarks in this specific gallery of unedited photos are permanent. If you order a print here in the Smugmug gallery, the watermark will be removed before the print is made or before I email an image. My photo blog on birds, nature, wildlife, bushwalking, hiking, travel, tourism, art and similar topics: http://disci7.wordpress.com/. My photo blog post on the 2012 Noosa Triathlon: Blogger: http://bit.ly/QF7IxV. Contact: disci7 AT gmail dot com. Bike Leg - 2012 Noosa Triathlon, Noosa Heads, Sunshine Coast, Queensland, Australia; 4 November 2012. Photos by Des Thureson. Camera 1. - The images in this gallery have not been edited / cropped. If you purchase* a print or download, these images will be edited / corrected / cropped before being sent out. *Ordering will be via http://disci.photoshelter.com or via email. Thanks, Des.